Muscle cells are excitable (i.e. they can respond to, and generate, an action potential) and they are capable of contraction (i.e. they can reduce in length). Muscle cells are called fibres or myocytes. They are divided into three groups, skeletal, smooth or cardiac, according to their characteristics. *Striations are alternating bands of light and dark which can be seen in skeletal and cardiac muscle fibres when examined under a microscope. They are the result of the highly ordered arrangement of the strands of protein that make up the bulk of the cytoplasm of the fibre and are responsible for fibre contraction. **The myocardium is the major layer of the walls of the chambers of the heart. You can’t command the movement of food through the gastro-intestinal tract or how quickly your heart beats or how much blood flows to your skin (involuntary control). Fig. 2: Skeletal muscle structure (Depositphotos.com). When a muscle is stimulated it contracts, that is, it decreases in length. Depending on the location, the result of that contraction will lead to different results. In a joint, like your elbow it can bring two parts (in this case: your forearm and upper arm) closer together or push them further apart. In the airways and blood vessels, contraction of rings of smooth muscle reduce the rate of air and blood flow, respectively, by narrowing the lumen. In the heart and bladder contraction leads to a build-up of pressure forcing blood or urine, respectively, out of the organ. In the gastrointestinal tract and the ureters of the kidneys contraction of smooth muscle in a segment of the tube leads to movement of fluid further down the tube through a squeezing type motion (peristalsis). Also, in the gastrointestinal tract contractions can contribute to the mixing and stirring of the contents within the tube. 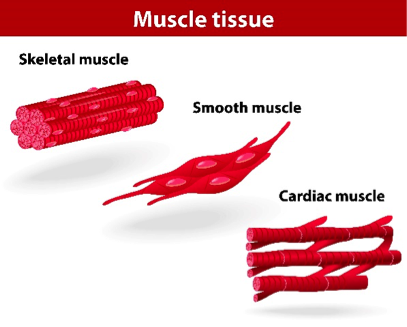 The actual process of muscle contraction is best illustrated by skeletal muscle cells. This is explained in a fun way in this video. Muscle contraction is the result of the generation of an action potential. In the case of skeletal muscle the action potential is brought about by the binding of the neurotransmitter acetylcholine to receptors on the muscle fibre. Changes in the concentration of calcium in the cytosol lead to both fibre contraction (increase in cytosolic calcium) and relaxation (return to a low cytosolic calcium concentration). The combined contraction of the individual units in the muscle fibre (the sarcomeres) cause the fibre to contract; the combined contraction of a muscle fibres bundled together (in fascicles) leads to contraction of the whole muscle. Both muscle contraction and muscle relaxation involve consumption of ATP. What is not shown, but what is common, is that muscles work in pairs to counteract each other. In the case of the biceps brachii, when the triceps brachii contracts (which is posterior to the biceps brachii) and the biceps brachii relaxes, the bone of the upper arm and the bones of the forearm are pulled away from each other. That is, as one contracts the other relaxes in order to move the forearm. Wherever bones come together they form a joint. There are several types of joint which are distinguished by how much movement can occur between the bones at that joint. The ones with the greatest degree of movement are the synovial joints. ​The joint structure is held together by bands of fibrous connective tissue known as ligaments. The bones are not in direct contact with each other. Firstly, the ends are covered with articular (hyaline) cartilage, which has a very smooth surface. There is a cavity filled with synovial fluid that enables the bones to slide easily against each other, but the fluid also acts as shock absorber when weight is put onto the joint. The actual movements that occur at a joint will be determined by the shape and arrangement of the bones involved. For example, the range of movement at the shoulder joint is much greater than at the elbow because of the differences in how the bones in each joint articulate with each other. ​Bones often serve as levers. A lever is a rigid structure that rotates around a fulcrum (provided by the joint between bones) with the muscle providing the effort that brings about the movement. In this Creative Learning video, the producers explain how the different parts: the muscle, the bones and the joint, work together to achieve movement. Don’t get too caught up in the mechanics here: it’s just nice to see how different joints work. Bone is a connective tissue where the cells are embedded in a matrix of protein and mineral salts. The image is a microscopic image of what you might see if you examined the shaft of a bone in your arm or leg. The bulk of the tissue is the matrix but you can see little individual blackened cavities and these are where the cells of the bone reside. The skeleton is not a static framework: remodeling in bones occurs constantly. Remodelling is where bony matrix is first broken down and then fresh bone is laid down. The remodeling is in response to the mechanical stress a bone experiences as part of movement and it contributes to bone density. Remodelling is also necessary for bone repair. The process of breaking down the matrix or the process of building it up is central to calcium homeostasis in the body. Calcium is a major mineral found in the body. However, the calcium concentration in body fluids is generally low. One of the reasons for this is several salts of calcium are very insoluble. Another being that there are number of biological processes that are regulated by changes in local calcium concentrations (e.g. neurotransmitter release and muscle fibre contraction & relaxation). Most of the body’s calcium is in bone as salts. Often these are salts with phosphates. What this means for the body is that it has (i) a reserve of calcium when required; and (ii) a site to store excess calcium. Two types of bone cells come regulate blood calcium levels. Osteoblasts are the cells responsible for bone mineralisation. Mineralisation is the process by which calcium, phosphate and other ions dissolved in the plasma are deposited as solid crystals upon the organic component (principally collagen) of the bony matrix. Resorption is the release of minerals from the bone back into the blood. Osteoclasts secrete acid to dissolve the salt crystals as well as an enzyme that degrades the collagen of the matrix. The action of osteoclasts will result in the release the minerals into the plasma. Varying the rates of resorption and mineralisation will modify the levels of these minerals in the blood. For example, if blood calcium is too low then it can be “topped up” by bone resorption. On a minute-by-minute basis the rates of how much resorption versus how much mineralisation is taking place is regulated by the blood calcium levels. In addition to this, parathyroid hormone (PTH) and calcitriol (1,25-dihydroxyvitamin D3) also regulate blood calcium levels. The role of these hormones is outlined in the diagram. The one you might be unsure about is “vitamin D hydroxylation”. Hydroxylation is part of the process of calcitriol synthesis in the body. ​Contraction and relaxation of muscle both consume ATP. The conversion of the chemical energy released from the breakdown of ATP to the work involved in fibre contraction and relaxation is not 100%. Instead a significant amount of the energy is released instead as heat. This is not a waste of energy since it is critical to maintaining normal body temperature. When body temperature drops one strategy used by the body to return body temperature to normal is the rhythmic contraction and relaxation of skeletal muscle. You would call it shivering.